Nice chunky cookies that are perfect to dunk (or not of course).... For all those that appreciate a great biscuit, these are the best! 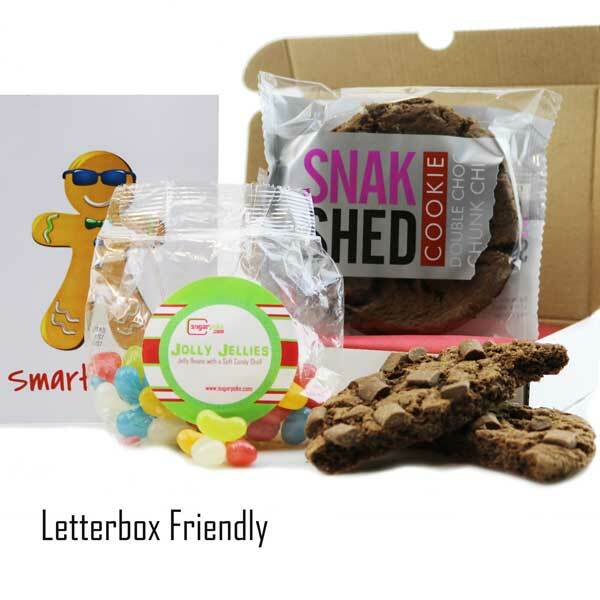 And teamed with the colourful Jolly Jellies this makes a great treat to send to anyone! Jolly Jellies - a big 125g bag jelly beans with a soft candy shell. Colourful and deliciously sweet jelly sweeties. 2 x Giant Double Choc Chunk Chip Cookies 90g - from the quirky Snak Shed, there's the bigger than most doubly delicious Double Choc Chunk Chip Cookie! With really chunky pieces of chocolate there's a double chocolate delight in every bite! And the best thing?, there's 2 of them in this pack! Double the delight! Great to send to someone that's just passed their exams, driving test or just been a bright spark!